Background: Yep, a vehicle again. The topic pretty much speaks for itself I guess, make a vehicle for a person who sells food to people. There is no specific setting for this one, it's completely up to you as designer. It can be a futuristic truck or a medieval cart or anything in between and above The topic was inspired by the floating boat from the movie 'the 5th element'. 1. 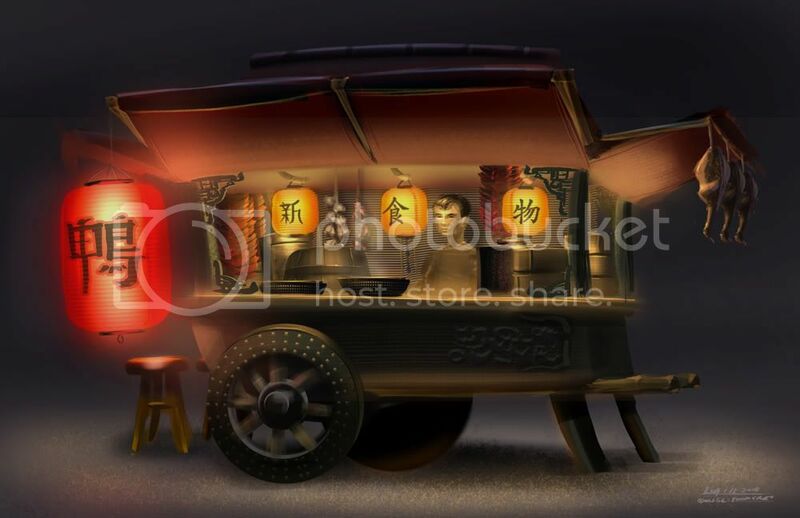 Design and draw a Food Vendor Vehicle. 2. It has to be a real vehicle, so no trays or other small stuff. A bike is okay though. This will be my first time competing ever! Hope its a good one this time around, good subject matter. "2. It has to be a real vehicle, so no trays or other small stuff. A bike is okay though." so... no hover hotdog stands? nvm, im retarded - carry on! Last edited by Legato; January 6th, 2008 at 01:01 PM. Depends, but I think you know what I mean As I say a bit above that line, it can also be pushed by the merchant. I had something bigger in mind though when I thought up this topic. I won't enforce that rule very strictly, but keep in mind that anything too small won't make it to poll. So, here's my first thoughts on the subject Not yet sure which direction to go in, so I tried to find some variations. Might do more of these before I continue with a final concept. Well, this is my "play with colours"-day. So, I guess I might be in.. if I manage to clean up perspective and all the other stuff... Heh. yoitisi, can the 'vehicle' be a creature? Nutkin: hmm only if it pulls it or something the like, but I don't want you to focus on the creature too much as this isn't COW. Form2function: Ha you're back After two rounds of smaller objects I thought a vehicle topic was justified. I promise to do more rounds like the last one though, as I think it was a succes. And I've never really done an IDOW at all, so this sounds fun. the devil is in the details, so we will just leave them right out. i just couldn't get that cab from total recall out of my head, so here is a similar vehicle rigged for mobile food prep and delivery. the image i am seeing is a modular unit used in normal space station expansion, but fitted with self propulsion and a sweet airlock hub that allows multiple shuttles or small ships to dock simultaneously. I did a *little* more on it. What is the chair for Sorkness? Searledesign: I don't think it's a chair on the left of Sorknes' design, I'd guess from the scale and position it's a counter or similar. OOOH!!!!! I'll draw the vehicle/machine/thing of my dreams!!! I I'll try to do it right. Just call 800-FoodToYourHome and we will be there! First sketch, some things to fix. yoitisi: I also am admiring the deft lines in your sketches. You clearly have some experience thinking this way and I'm excited to see what you'll come up with. They both seem a little bland to me, so any input would be really appreciated. Hey everyone. I'm gonna crank mine out for tomorrow. Still thinking away. Yoitisi: great stuff. Like the one concept where the driver steers standing up! stumpy: Because that cab is similar to the one in total recall, I reckon you should drop it and try go for something more original. I really like your idea of a Food Vendor in space! I think you should expand on that idea! Sorkness: I was going to mention the perspective but you have already (: Its a cool little idea, though I suggest working on that counter / chair looking thing that people seem to be debating over. D-Holme: you have some nice sketches going there, I'm curious to see how your final turns out. PutritusCor: Right now you idea seems more like a floating restaurant to me more than a food vendor. Careful you don't make the same mistake I did with the "Main Battle Tank" theme. 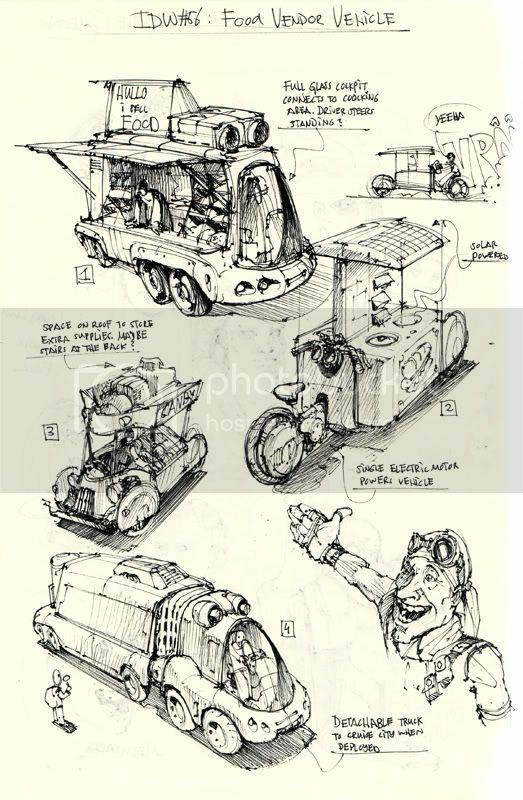 smws Its funny...never heard the word "dirigible" before had to look it up (: So far your airship concept interests me the most, but ths 3rd sketch (taco truck) seems the most solid. migsta nice and simple. I can't really tell from the sketch whether it hovers or sits stationary...or whether the vendor drives it somehow...or pushes it around??? I'm sure those questions will be answered once you render everything out. Stumpy: I agree with :::rain:::, the space thing seems much more interesting. However, you need to step up the quality of your design and drawing in order to make it to poll. I suggest you try drawing bigger and with thinner lines, as it's rather rough right now. Also, just a collection of basic shapes as boxes, tubes and spheres is cool but a good design needs more, a way to connect all those shapes. Details are also important to help sell the idea. Sorkness: Yep, fix the perspective first thing I'd say. The idea is nice though. One thing that bothered me were the big exhause flames coming out from under the vehicle, as they distract a lot of attention away from the vehicle itself and it also seems a bit overpowered right now. D-Holme: I really like that airship idea. The face up front and just overall idea made me think it could come straight out of Spirited Away. As for those lines, it would be nice to see you do some more confident strokes this time. I know from previous rounds that you tend to make the sketch a bit scribbly. It's great because it gives your work it's own style, but sometimes it can't hide the fact that there are mistakes in the perspective which you need to focus on a bit more. 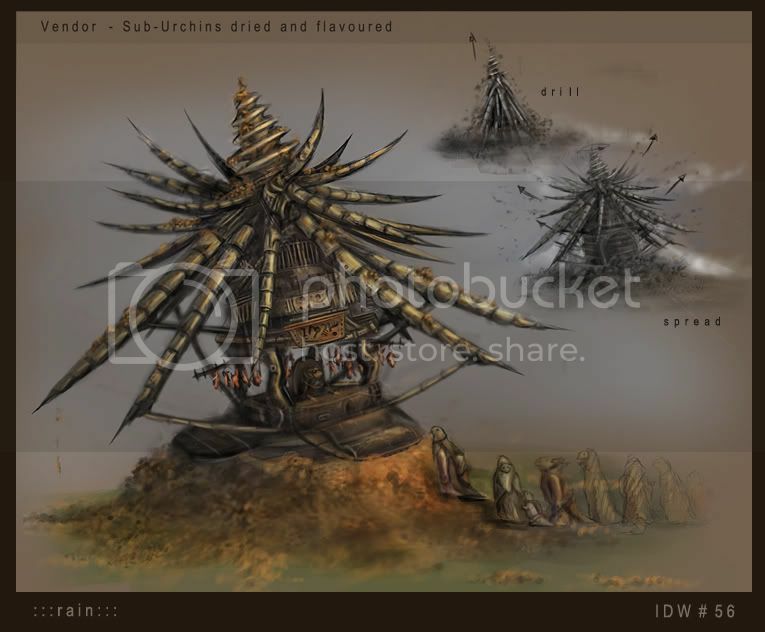 PutridusCor: I agree with :::rain::: here, it starts to look like a floating restaurant, which is not really what this topic is about. Try to make it a bit more of a vendor, instead of a restaurant. 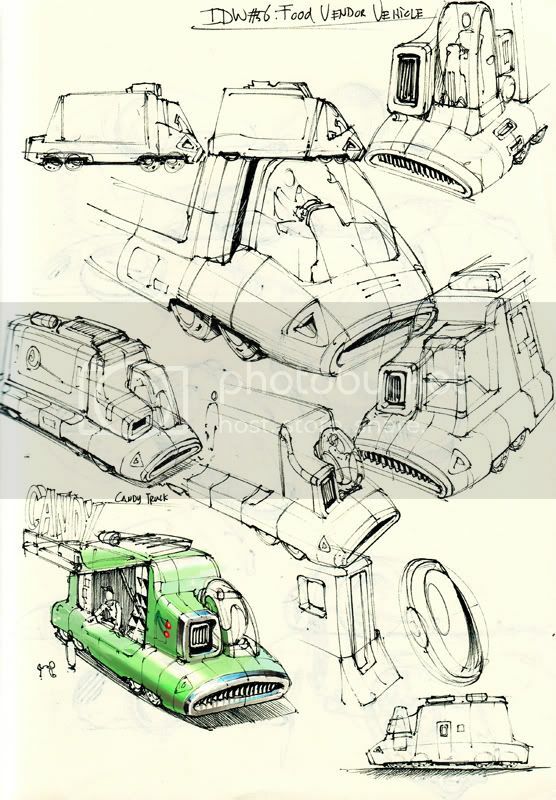 smws: I think the truck on the left and the airship are the better ones, and at the moment the airship looks more promising. If you're going for the truck I suggest you lower the perspective somewhat so we can look under the canvas as well. Migsta: Nice little hotdog stand I think it might be usefull here to show a person standing next to it to show it's scale. Also, you might find it usefull to draw your vehicle a bit more transparent to begin with (like drawing the part you can't see as well as stuff you can see), as this helps greatly to keep the perspective and proportions right. Okay, so here's some more work on my Candy truck I might just be able to finish it. Oh and I'll close this thread tomorrow in about 24 hours from now, as usual. orion: i think you should put the spokes into the back wheel. it looks too much like a big blob. Also, the chickens could do with a bit of size difference. its too obviously copied. Also, maybe it looks too heavy to be carted about by hand. You were totally right, I was being taken away by my stubborness and my dreams of a perfect restaurant. I'll have a new design ready in a few hours. Some really proposing entries, folks. Trying to find the energy and inspiration to work up my own, but I'm not sure it'll happen. Not terribly happy with the concepts I've come up with so far. Either way, looking forward to seeing all the finished entries tomorrow! Edit: Yup, definitely not going to be entering this one or any other for a bit. Just managed to kill my tablet pen... Didn't think it was possible, but live and learn. Last edited by form2function; January 13th, 2008 at 12:51 AM.